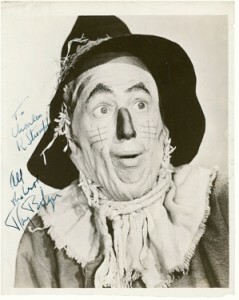 Although he had racked up numerous stage and screen credits, rubber-legged song-and-dance man Ray Bolger will forever be remembered by children of all ages as the Scarecrow who accompanies Dorothy, the Tin Man and the Cowardly Lion to the Emerald City in search of “The Wizard of Oz” in that 1939 MGM classic. A tall, slender man whose physical capacities as a dancer often mystified audiences (he was so lithe as to appear double-jointed), the Massachusetts native began his career in vaudeville. Although generations came to know him through his musical roles, Bolger first and foremost considered himself to be a comic actor, skills he first honed with the Bob Ott Musical Comedy Repertory in the early 1920s and later as part of a vaudeville act. In 1926, he was spotted by Gus Edwards who hired him as a comedian for the Broadway show “A Merry World”. Other stage roles followed, most notably as the lead in the Rodgers and Hart classic “On Your Toes” (1936), introducing the now famous “Slaughter on Tenth Avenue” number. Based on the strength of that performance, he was signed to a film contract by MGM.